Mechanical Engineering at IIT Madras » Dr. Gnanamoorthy, R.
Prof Gnanamoorthy received his Doctor of Engineering (Dr Engg) degree from Nagaoka University of Technology, Japan. He served at Institute for Materials Research, Tohoku University Japan, as a regular employee before joining as Faculty at IIT Madras in 1997. His teaching and research interests include on Advanced Materials & Product Design, Design with Polymer and Nanocomposities, Machine Element and Special Purpose Test Machine Design, Damage Tolerant & Tribo Design, Behavior of implant materials, and Surface Engineering. Prof Gnanamoorthy has published more than 250 original research publications in reputed International Journals and Conferences. His research publications were cited in more than 1200 research publications worldwide. He has guided 7 Doctoral scholars and holds a patent on innovative surface modification process for surface nanocrystallization and fatigue life improvement. 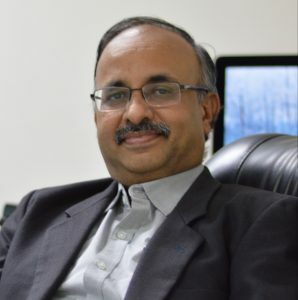 He has successfully completed many sponsored research projects for Government organizations such as NRB, ISRO, DST, IGCAR and offered consultancy services to reputed Industries in India and Abroad. Prof Gnanamoorthy, served as the Founder Director of IIITDM Kancheepuram, and established a state of the art of green campus at the outskirts of Chennai and is an architect of Design Centric Engineering and Smart (Industry 4.0) Academic Programs in India. He has also served as the Mentor Director for IIITDM Kurnool, AP and Director i/c for the Central Institute for Classical Tamil, Chennai. S Anand Kumar, R Sundar, SGS Raman, R Gnanamoorthy, R Kaul, K Ranganathan, K S Bindra, Effect of laser peening on fretting wear behaviour of alloy 718 fretted against two different counter body materials (2017) Proc of the Inst of Mech Engineers, Pt J: Journal of Engg Tribology, https://doi.org/10.1177/1350650117692707 . C Gurunathan, R Gnanamoorthy, S Jayavel, Effect of reinforcement forms in selectively reinforced polymeric composite : temperature distribution under sliding contact conditions, (2016) Int J Plastics Technology 20 (2), pp. 265-278. C Gurunathan, R Gnanamoorthy, S Jayavel, Prediction of frictional heating and temperature distribution in selective ceramic-reinforced polymer composite, (2014) Proc of the Inst of Mech Engineers, Pt J: Journal of Engg Tribology, 228 (12), pp. 1433-1442. SA Kumar, S Pradhan, SGS Raman, R Gnanamoorthy, Performance of alumina coatings prepared by hard anodizing, micro arc oxidation and detonation spray processes on Al–Mg–Si alloy under fretting wear loading, (2014) Proc of the Inst of Mech Engineers, Pt J: Journal of Engg Tribology, 228 (4), pp. 454-462. Anand Kumar, S., Ganesh Sundara Raman, S., Sankara Narayanan, T.S.N., Gnanamoorthy, R. (2013) Prediction of fretting wear behavior of surface mechanical attrition treated Ti-6Al-4V using artificial neural network Materials and Design,49, pp. 992-999. Charles, D.F., Gnanamoorthy, R., Parag, R. (2013) The effect of nanoclay reinforcement on the rolling contact fatigue behaviour of polyamide Proc of Inst of Mech Engineers, Part J: J of Engg Tribology, 227 (1), pp. 84-95. Anand Kumar, S., Ganesh Sundara Raman, S., Sankara Narayanan, T.S.N., Gnanamoorthy, R. (2013) Influence of counterbody material on fretting wear behaviour of surface mechanical attrition treated Ti-6Al-4V Tribology Int,57, pp. 107-114. Arun Prakash, N., Gnanamoorthy, R., Kamaraj, M. (2012) Surface nanocrystallization of aluminium alloy by controlled ball impact technique Surface and Coatings Technology, 210, pp. 78-89. Arun Prakash, N., Gnanamoorthy, R., Kamaraj, M. Fretting wear behavior of controlled ball impact treated aluminium alloy under dry sliding condition (2012) Surface and Coatings Technology, 207, pp. 450-460. Arun Prakash N, Gnanamoorthy, R and Kamaraj (2012) ‘Fretting wear behaviour of fine grain structured aluminium alloy formed by oil jet peening and process under dry sliding condition’, Wear, 294-295, p.427-437. Kodeeswaran M, Gnanamoorthy R (2012) ‘A novel controlled impact process for the formation of nanostructured surface in AISI304 stainless steel’, Surface & Coatings Technology, 207, pp. 227-232. S Kirupa Sankar, C Gurunathan. R Gnanamoorthy, (2012) ‘Transmission efficiency of polyamide nanocomposite spur gears”, Materials & Design, 39, 2012, p.338-343.